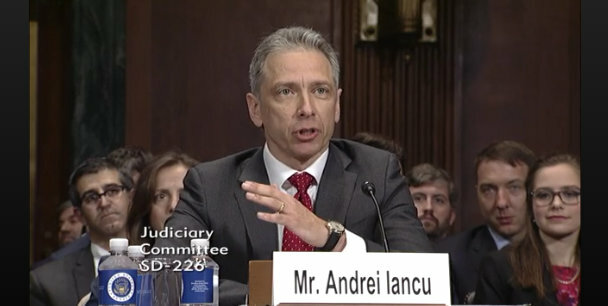 Andrei Iancu testifies before the Senate Judiciary Committee on November 29, 2017. Earlier today President Trump’s nominee to become the new Under Secretary of Commerce for Intellectual Property and the Director of the United States Patent and Trademark Office was unanimously approved by the Senate Judiciary Committee. “We congratulate Mr. Iancu on his support from the U.S. Senate Judiciary Committee to be Director of the U.S. Patent and Trademark Office,” said Innovation Alliance Executive Director Brian Pomper. “We believe he will heed the views of independent inventors, entrepreneurs, and various industry groups—all those that form our U.S. innovation ecosystem.” Pomper would go on to urge the full Senate to approve the Iancu nomination as soon as possible. “We look forward to working with Mr. Iancu in creating a strong and stable U.S. intellectual property landscape for entities of all sizes, enabling the U.S. to reassert its position as an international leader in innovation,” Pomper said. Favorably reporting Andrei Iancu to the full Senate for confirmation as Director of the USPTO is an important next step along the nomination path. This being done today sets up a possibility that Iancu could be confirmed by the full Senate before the end of 2017, although time is fast running out. With certain noncontroversial nominations it is not uncommon for deals to be struck between Senate leaders to allow nominees to be confirmed by unanimous consent, which allows a package of nominees to be confirmed without requiring individual up or down votes. These deals can be somewhat typical immediately preceding a recess, as was the case in August 2017 when dozens of Trump nominees were confirmed via voice vote. Given the unanimous vote in the Senate Judiciary Committee it would seem that Iancu’s nomination would easily qualify as noncontroversial. But being favorably reported by the Judiciary Committee so close to the end of the working year may make it too late for confirmation by unanimous consent, assuming that would be the way the Senate chooses to proceed. According to the 2017 Legislative Calendar, the last day the Senate will be in session is Friday, December 15, 2017. Having said that, the Senate has scheduled action on three nominees for Monday, December 18, 2017. Iancu is not one of those nominees, and he is likewise not listed on the December 14, 2017 Executive Calendar. Given that the Senate has presently not scheduled anything beyond December 18, 2017, Iancu’s confirmation by the full Senate seems likely to fall over into 2018. Of course, nothing in Washington, DC is ever really a sure thing. Stay tuned! Let’s hope this works out better than Michelle Lee.